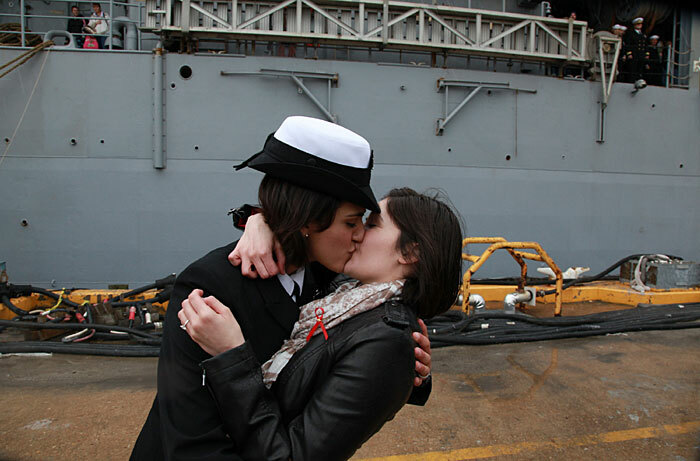 It’s a time-honored tradition at Navy homecomings – one lucky sailor is chosen to be first off the ship for the long-awaited kiss with a loved one. Today, for the first time, the happily reunited couple was gay. UPDATE: In case you haven’t seen the video, here it is. The one in civilian clothes should have kicked up her heel to make it look more like the famous Times Square VE Day photo. I can’t take pictures, but I know a good one when I see one.